The free exercise videos below are my best effort to teach you proper movement patterns when you exercise. On screen instructions at key transition points will help you understand how to match what you see in the videos. Check out the sample videos on this page and click the titles below to see more exercises in each category. 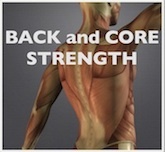 Remember--good posture and movement are the keys to success when you are training to develop your strength. 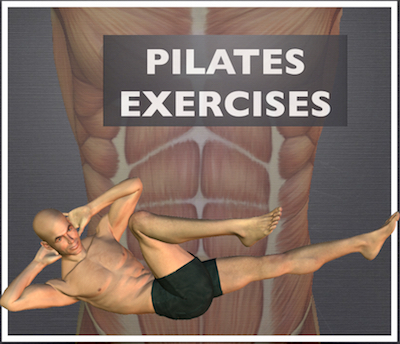 7 abdominal exercise videos arranged from easiest to most difficult. You will need a foam roll for 1 exercise and a stability ball for another. To try workouts using these exercises, see the articles on back strengthening exercises and pilates sample exercises. 5 videos for exercises that isolate the lower back muscles, also arranged from easiest to most difficult. No exercise equipment needed other than a mat. The articles on back strengthening exercises and pilates sample exercises include the lower back exercises in a workout. 7 exercise videos for the muscles of the shoulders and arms. You will need a resistance band for several of the exercises. For a full upper body workout, see resistance band exercises and for a combined upper / lower body workout, try body weight exercises. 8 exercise videos that target muscles of the hips and thighs. You will need a stability ball for 2 of the exercises. For a full lower body workout, see knee strengthening exercises, and for a combined upper / lower body workout, try body weight exercises. 6 exercise videos combined into a workout for the upper and lower body. You will need a resistance band for this workout. 7 exercise videos combined into a workout for the upper and lower body. No equipment needed, though an exercise mat may help. 5 exercise videos combined into a challenging workout for the core and upper body. You will need a stability ball, and also a foam roll to try the advanced variations. Most of the free exercise videos are about 1 minute long. Each video includes instructions at key transition points to help you perform the exercises correctly. Many exercises have multiple levels of difficulty, so you can easily make your workout easier or more difficult. As mentioned previously, there are a number of articles that group these exercises in 15 minute workout routines. See below for more details. 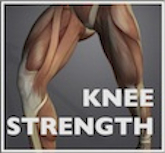 Target the thigh, hip, gluteus, and calf muscles that work together to support and control the knee joint. Improve your balance and muscle tone. A more intense version of the above back strengthening exercises. The videos on this page help you develop greater control over your body movements. A full body strengthening routine designed for beginners and for people who are getting back in shape after a layoff from exercise. No equipment is needed for this routine. A challenging upper body and core strengthening routine. Build strength and develop balance in your torso and shoulder girdle.